In addition to the events listed on our flyer, we are having a question and answer session with Hadrian Ellory-van Dekker, recently appointed Director and Chief Executive of Swindon Museum and Art Gallery Trust on Thursday 25 August starting at 7.30pm. 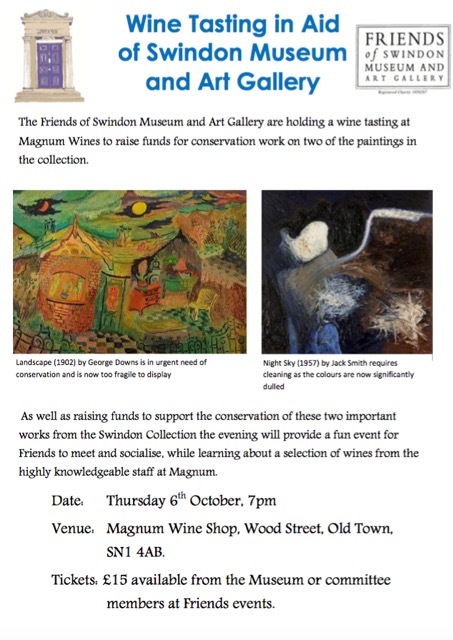 Tickets £5, raising funds for the restoration of 2 paintings. On sale to Friends only until a week before the event. Drinks and nibbles and a raffle. Our second extra event is a wine tasting at Magnum in Wood Street on Thursday 6 October starting at 7pm. Tickets available from the museum, and several members of the Friends' committee.